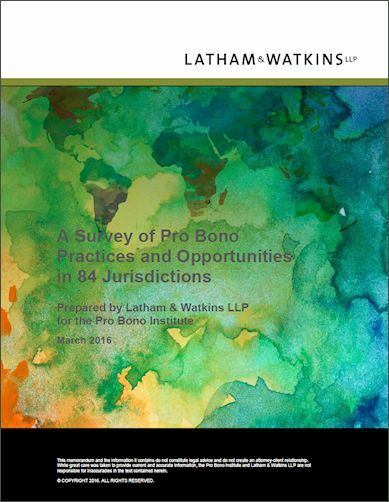 A new edition of A Survey of Pro Bono Practices and Opportunities (now) in 84 Jurisdictions prepared by Latham & Watkins LLP for the Pro Bono Institute has recently been published. The 2016 Survey now explores pro bono work and opportunities in 84 jurisdictions around the world, from Angola to Vietnam (up from 71 in 2012). It is an educative resource that examines and compares the experience of countries in the Americas, Europe, Asia Pacific, Africa and Middle East and seeks to draw attention to, promote and facilitate the provision for pro bono legal services. The Survey acknowledges that Australia now prides itself as being one of the worlds’ leaders in providing pro bono legal services. The role of legal aid commissions and community legal centres has also been highlighted as key to ensuring access to justice for marginalised and disadvantaged people. The Australian Pro Bono Centre’s 2014 National Law Firm Pro Bono Survey, its Eighth Annual Performance Report on the National Pro Bono Aspirational Target and the Australian Pro Bono Manual have each been mentioned in the publication. The authors acknowledge that in the Australian context, opportunities to undertake pro bono legal work have increased through the establishment of pro bono clearing-houses, and internal pro bono programs within law firms, corporations and government. However, the authors argue that more can be done to ensure the development of mechanisms that foster pro bono work, particularly at Australian law schools. The publication also draws attention to the fact that there is no express constitutional or common law right to free legal services in either civil or criminal matters, nor any specific rules that requires members of the legal profession to engage in pro bono work. This is a wonderful resource that sets out details of the ‘legal assistance sector’ in numerous countries around the world. Overall, it provides a strong picture of the need for pro bono legal services and the growth in engagement of the profession in such work. It also exposes the unmet legal needs of each country, and the importance of lawyers everywhere continuing to fight to improve access to justice.